First stop was plantswoman Derry Watkins’ nursery in Wiltshire (see Derry’s poppies in main picture!) – and another Garden House tradition, getting the coach stuck in narrow twisty country lanes! Our intrepid driver Andy, who knows us well by now, worked miracles in reverse gear while the rest of the party continued a short distance to the nursery on foot. Derry was in China, but her lovely staff were very welcoming and informative. After lunch in the house – with views overlooking the surrounding fields and hills – we had a talk on how the nursery works, and a tour of the various areas, from propagation to sales. Which meant that we fell on the amazing array of tempting plants in this small but versatile nursery. 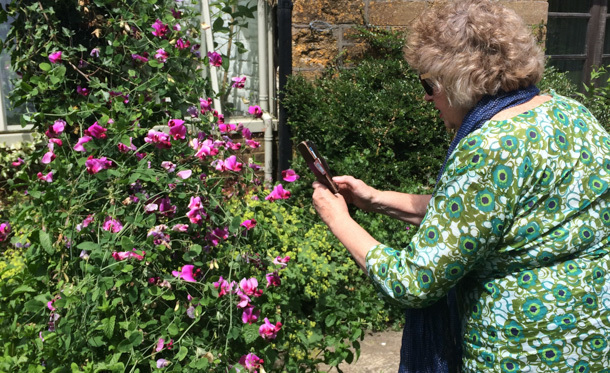 Then tea and cake (of course – you never go hungry on a Garden House trip) and a wander around Derry’s steep terraced garden, trying to match up the plant lists with what was growing. There were beautiful eryngiums, salvias, poppies and hardy geraniums, to mention just a few. The afternoon was cool, grey and drizzly; looking back from the middle of a heatwave and drought, this seems something of a miracle now. Next, our base for the next few days, the Eastbury Hotel in Sherborne, Dorset. It has a pretty garden and a part-time gardener who was happy for us to store our plant purchases safely in the shade and gave us access to watering cans. The sun was shining for our visit to the Hauser & Wirth gallery at Bruton, Somerset, the following morning. 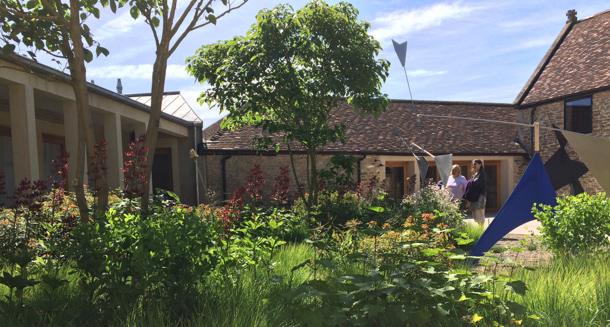 This is an amazing exhibition space in old farm buildings, some of which date back to the monastic era, and set in carefully curated gardens, mainly designed by Piet Oudolf. The current exhibition is artwork and installations by Alexander Calder, which fitted perfectly into the interior spaces and the spectacular planting of the courtyard. There was lots of time to wander or sit, take photographs, and puzzle about some of the plants in the huge meadow garden, before we convened in the outdoor restaurant for lunch. The gallery and garden is open 6 days a week, free entry, and highly recommended. In total contrast, our next visit of the day was to Charles Dowding in the nearby village of Allhampton. Charles is the guru of no-dig vegetable growing and showed us round his prolific garden, giving us all sorts of tips and challenging some accepted wisdom. We saw the long bay of compost heaps, the covered areas where seedlings were grown on the heat created by – basically – a mound of manure, and a small productive area by the house which was more readily translatable to our own gardens. All finished with lemon verbena tea. 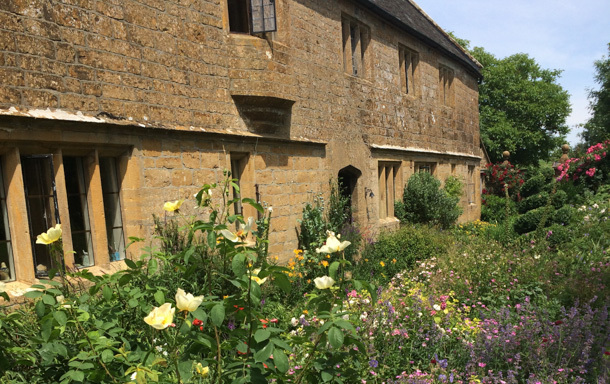 Next morning, off to the Jacobean Newton House, near Yeovil, which combines a large private garden and a bespoke gin distillery! We had the gin tour – but sadly no tasting – and learned that the small-batch gin is made with their own spring water and botanicals grown in the garden. 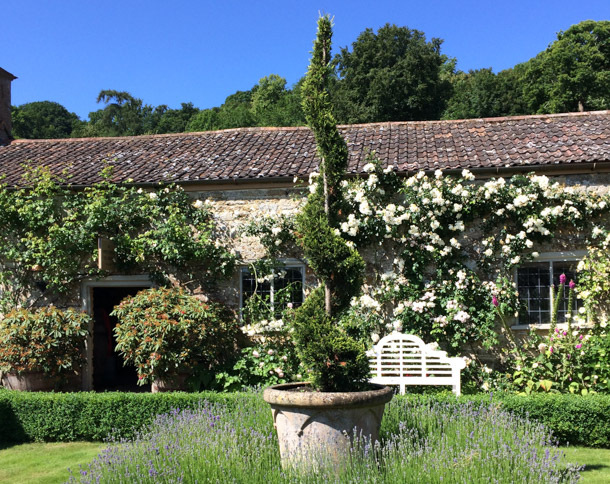 Then we were free to wander the gardens, which incorporated old walled formal gardens, many climbing roses, several informal throw-and-sow beds, two ancient carp ponds, and meadows leading down to a river. Some of the planting was relatively recent but there were many impressive mature trees in the lush green landscape and the sun blazed down, making it very picturesque. After coffee and fab home-made biscuits at the red gingham-themed tea room-plus-gin bar, and some eager gin purchasing, we returned to visit Sherborne for a couple of hours. Our next port of call was Corton Denham House. Here we were given an extensive tour by our host, Dr Robin Odgers,of the five lovingly cultivated acres – which included so many varieties of tree that it should be called an arboretum! The good depth of rich soil, which we were told rolls down the steep hill above the house, irrigated by numerous springs, and the shelter from so many larger trees, meant that growth was unbelievably rapid. Saplings planted 5 years ago were high above our heads. In the newest planting area the owner continues to squeeze ever more trees into the spaces between the last batch planted. It was a lovely eccentric way of managing a garden, and his motto is ‘You’re never too old to plant a tree’. 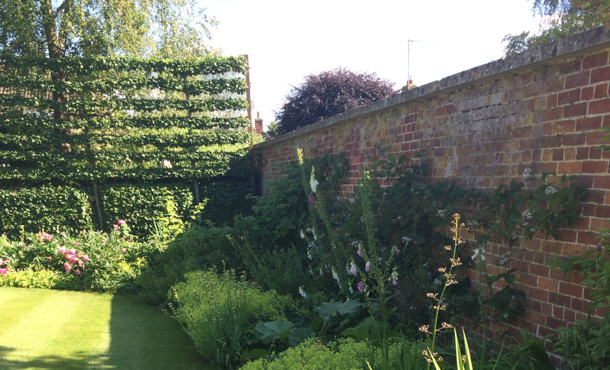 We were also impressed with the walled vegetable garden and stunning tall ‘garden fence’ of pleached hornbeam which made for good neighbours, as it let light and air through but gave sufficient privacy. We learnt that fruit trees are espaliered while non-fruit trees are pleached (same technique) and picked up much useful information about growing fruit, veg, and hedges. A short stroll away was the Queen’s Arms where we had dinner, and which is supplied with produce by the Corton Denham gardens – so local we could count the ‘air metres’ rather than ‘air miles’ – and to kickstart a great evening, an uproarious wine tasting quiz, the results of which will stay forever a Garden House secret! Our last visit before heading home on Saturday was to Lower Severalls garden and nursery, near Crewkerne, so at last another chance to buy plants. Unlike on previous trips, the coach did notresemble a botanical gardens greenhouse by then. Lower Severalls is a typical cottage style garden with overflowing beds of flowers, herbs, and roses, and lots of self-seeded plants amongst the paving stones. A charming glazed room against the house-wall had a small pond and interesting pelargoniums and tender climbers. Mary, the owner, provided us with a lovely lunch on tables on the lawn outside the beautiful Grade 2 Ham Stone house. Then we pottered round the nursery, which is small but has a really good selection of unusual perennials, herbs, and wild flowers, with a few shrubs. Mary’s assistants were very well informed and super helpful about the plants. Once again, thanks to Bridge and Deborah for arranging a unique garden tour, with lots of lovely flowers, food for thought, and – well – just food. You blessed us with the perfect weather, too, to make everything look gorgeous without being too hot, so extra points for that! Looking forward to the next trip.